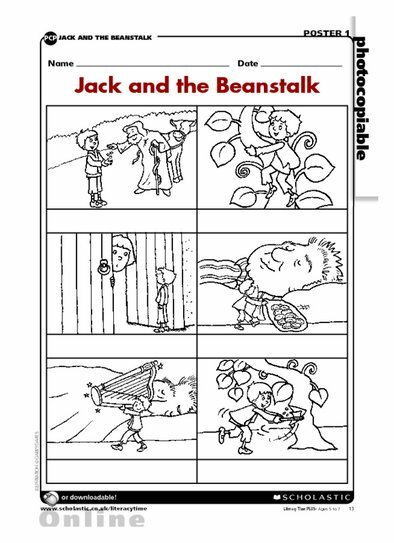 Cut out these Jack and the Beanstalk pictures and encourage children to put them in order to sequence the story. You could laminate them for reuse or let the children stick them into a small storybook. Try asking children to compose sentences for each picture and to use these to use these to retell the story to a friend or as a plan for writing the complete story. See if the children can identify any gaps and ask them to fill these in by composing more sentences. Alternatively, you could hand out the laminated cards and, in shared storytelling, ask the children to hold up and talk about their picture when their part of the story is reached.